Okay… it might snow–then again, it might not. Either way, Im going to be ready with this yummy treat. The original recipe at Epicurious.com says this serves 8. That’s not even close. Four, if you’re lucky. More like two… two large bowls. In a bowl, combine raisins and rum; let soak for 30 minutes. Combine the rice, the salt, and 3⁄4 cup water in a 2-quart heavy-bottomed saucepan over medium-high heat. Bring to a boil; stir; reduce heat to medium-low. Simmer, partially covered, until water is absorbed, about 6 minutes. Stir in 2 cups half-and-half, brown sugar, and cinnamon sticks and bring to a boil. Reduce the heat to medium-low; simmer, stirring, until rice is tender, 20–25 minutes. Slowly stir in egg yolk; cook for 1 minute. Remove pan from heat; add raisins with rum, remaining 1/2 cup of half-and-half, and vanilla; let sit for 10 minutes. 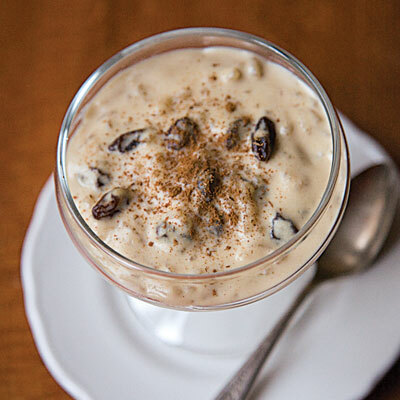 Spoon pudding into serving glasses; sprinkle with ground cinnamon.